I actually got some positive feedback for my blog! I had written a blog about the importance of good ergonomic matting and I am going to add a bit more evidence. In the last year, one customer has added 1368 square feet of matting to their building. The cost for these mats has been $9,300. This investment has cost the company less than half of the projected cost of a back injury! One of the mats that we prefer is the Hog Heaven mat from the Andersen Company. This mat has as static dissipative nitrile rubber surface, which is resistant to oils and chemicals. It performs very well in Industrial environments. The top is textured for slip-resistance. 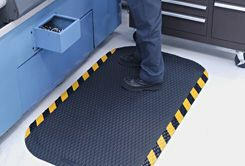 This mat will not curl or crack and it has four OSHA colored safety borders available. The mat has a gentle bevel around the edges, which removes the tripping hazard created by some mats. It is also safe to use in welding production areas. The National Floor Safety Institute has certified this mat as slip resistant. The mats come in standard and custom sizes, so there are hundreds of configurations. Best of all, the manufacturer faithfully ships standard or custom mats in 5 days or less, so you don’t have to wait long. We think this mat is the most comfortable one on the market and it a great value. We have a number of Hog Heaven mats that have been in service at customer locations for over 5 years, without a complaint! This morning I was greeted with several orders from the same customer for ergonomic mats. It’s a great way to start the day. I think good Ergo Mats are the single most cost-effective investment for a company. The cost is very reasonable and the benefits to employees are huge. We provided mats to an entire production area, and when I would visit the plant the workers on the line would yell at me “Hi, Mat Lady” and “I love my Mat”. I had one lady tell me that the mat had greatly improved her life. Since we provided the mats she and her husband had been going out dancing again. A good Ergo Mat is $60-$70. Amazing how a few dollars can really improve the quality of work and personal life! Talk to someone that really knows ergonomic matting, buy some good mats and improve health, safety and morale at the same time.